Belly has been going to the summer house in Cousins Beach since she was young it's her favorite place on Earth. "It held millions of promises of summer and of what just might be"(Han.2). One of Belly's favorite things to do is go night swimming. "At night when [she] couldn't sleep, [she'd] sneak downstairs and go for a swim in the pool. 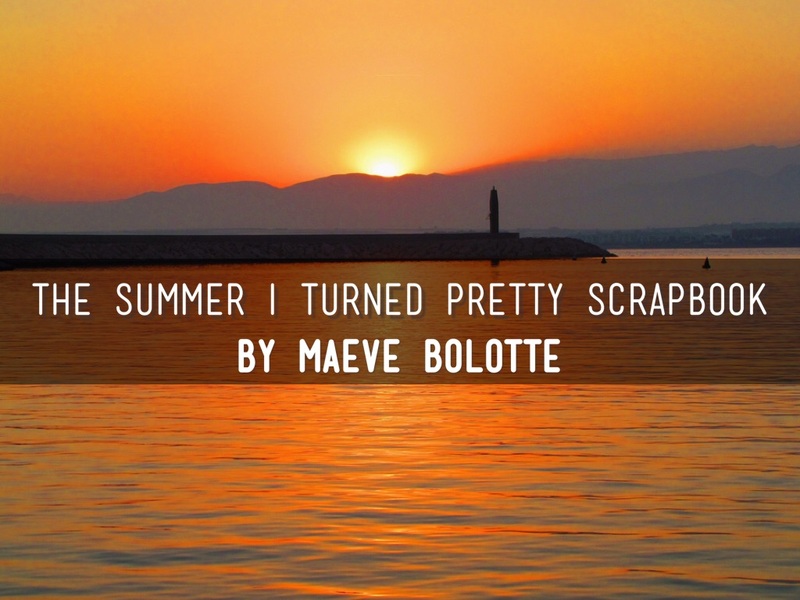 "(Han.36) Belly was in love with summer and in this book it was the summer she turned pretty. Conrad is one of the boys Belly spends every summer with. "Conrad was the older one...he was dark,dark,dark. 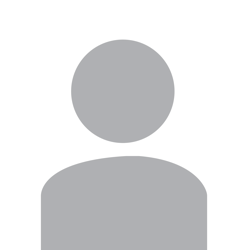 Completely unattainable, unavailable."(Han.5). Conrad is a very mysterious person in the book. "Conrad preferred to be alone, playing his guitar."(Han.6). 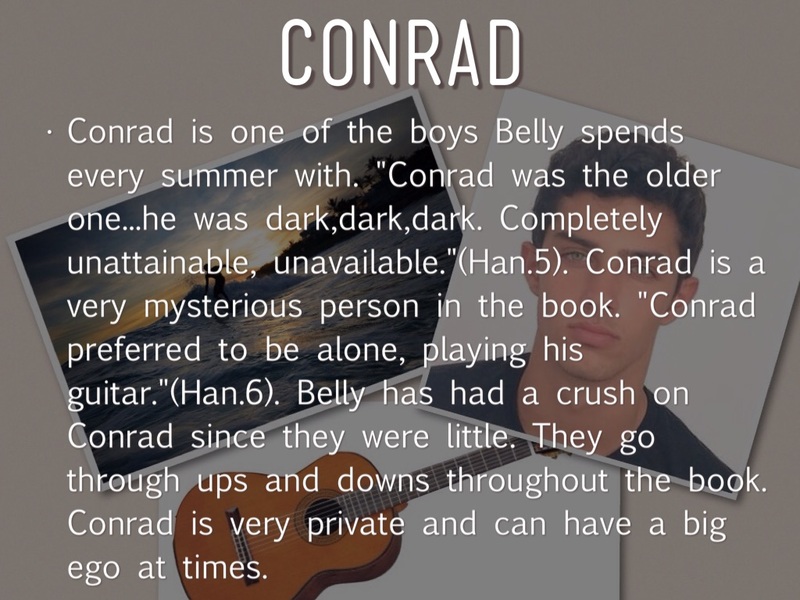 Belly has had a crush on Conrad since they were little. They go through ups and downs throughout the book. Conrad is very private and can have a big ego at times. 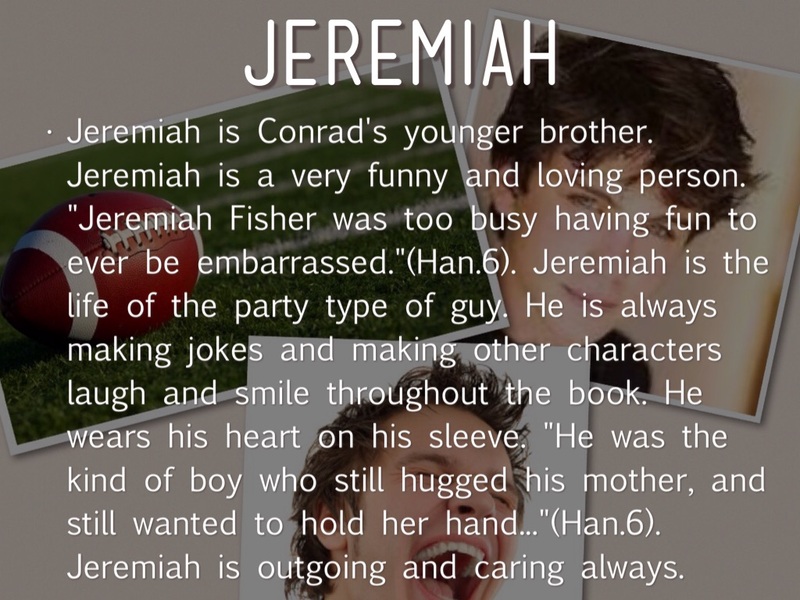 Jeremiah is Conrad's younger brother. Jeremiah is a very funny and loving person. "Jeremiah Fisher was too busy having fun to ever be embarrassed."(Han.6). Jeremiah is the life of the party type of guy. He is always making jokes and making other characters laugh and smile throughout the book. He wears his heart on his sleeve. "He was the kind of boy who still hugged his mother, and still wanted to hold her hand..."(Han.6). Jeremiah is outgoing and caring always. Susannah is Conrad and Jeremiah. She has a huge impact on the story. "Susannah always spoke in absolutes...it sounded like a proclamation, like it would true because she said so." (Han.21). Susannah suffers from cancer and it impacts the story hugely. Yet she keeps a positive attitude in the story and is one of Belly's favorite people. Susannah treats Belly like her daughter. Belly stated, "...she loved sharing me with my mother..."(Han.56). Susannah is impacting.